Two police officers were wounded and a sword-wielding man was killed Wednesday in a shooting inside the Church of Scientology in Inglewood. Police responded to the building in the 300 block of S. Market Street after a report of a man entering the Church of Scientology carrying a sword. 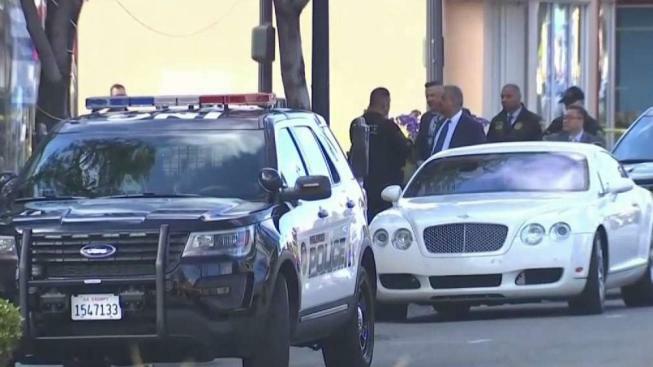 The man, who arrived at the building in a white Bentley and wore a hooded sweatshirt, was hospitalized in grave condition after being shot in the head and died a short time later, police said. His identity was not immediately available. It was not immediately clear why the man was at the location. One police officer suffered a hand injury, the other suffered an injury to an arm, police initially said. Inglewood Chief of Police Mark Fronterotta told NBC4 that it was not clear if the officer wounded in the arm had been shot or sliced by the sword. The police chief said the other officer had been shot in the thumb. It was not clear how the officers were struck by gunfire. Police did not say whether the man with a sword also had a gun. Both officers were hospitalized with non-life-threatening injuries and in good condition. One officer has been with the department for 10 years and the other for four years. The Church of Scientology released a statement thanking the Inglewood Police Department for its "rapid response in protecting our parishioners and staff members." Market Street remained closed Tuesday night for the investigation.